Are you a window display designer or own a shop and still don’t know how to decorate it? In today’s article, from Verdissimo, we’ll give you a few ideas so your window designs are unique and also follow the latest trends in shop design this season, as well as show you how to decorate a window display. Plants and flowers are widely used products in window display designs, especially in winter (Christmas) and spring-summer. Window displays for these seasons are usually the most stunning because they reflect the greatest seasonal changes from cold to hot. That’s why window displays during these seasons should inspire and express the shop’s style. Wondering how to design one? It’s simple: use the right products and colors. To decorate a window display, there are numerous preserved products at Verdissimo that you can use. It all depends on the vibe you want to give off. Some of the most common products include: white roses for decorating, flat moss, moss balls and even floral fillers and preserved trees. Creating floral décor in a window display during certain seasons is key for catching the attention of customers outside your shop. However, you should keep in mind the type of shop or store you’re decorating, since decorating a pharmacy and a clothing store is distinct. The latter lends itself more towards floral arrangements and compositions made with branches, trees or preserved roses. By decorating window shops with Verdissimo’s products, you can make them spectacular or subtle, with small or large flower and plants, and place them on the floor, in doorways or in the front window. It’s up to you! In the image below, we’ll show you a window display decorated using Verdissimo’s products, especially highlighting preserved moss. Besides flowers, plants or trees that you want to use for decorating your window display, you should also select other products, including furniture. Your furniture, plants, colors, etc. should match the season and decorative style of your window display. So, you can’t put industrial-style furniture with boho-style plants and flowers, for example. There must be coherence between each one of the products in the window display. This is one of the most important aspects when decorating a window display or any other space! It’s key to create spaces with harmony. 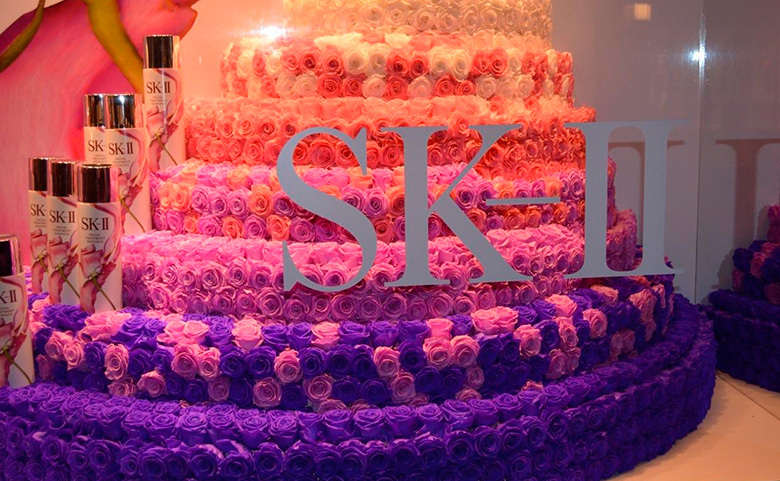 Colors should take a leading role in your window display – especially if your shop has to do with fashion. Here are today’s 10 trendiest colors: they’re both bright and traditional, as well as commonly found in nature. Primrose Yellow: This yellow color is very soft and bright, capable of conveying calm and optimism. It’s perfect for decorating springtime window displays, and even can be used for decorating summer window displays. Pale Dogwood: Pale Dogwood is a pale pink ideal for women’s fashion displays and even for interior decorating displays. We adore combining it with browns and whites. Hazelnut: Hazelnut is ideal for decorating autumn window displays. This color matches well with others, which is why we opt for using it to decorate window displays. Hazelnut is a safe bet! Island Paradise: Island Paradise is a light blue, similar to turquoise but less intense. It conveys lots of peace and calm, and it’s the perfect color for decorating summer window displays, especially to create beach and paradise scenes. Greenery: Greenery is a very bright green. It conveys naturalness and hope. We adore it for decorating interior decorating displays related to nature – for example, a tropical style. Flame: Flame is a very light orange. It’s an ideal color for adding color to autumn window displays. It goes well with brown or beige and it’s capable of conveying calmness. Pink Yarrow: Pink Yarrow is an intense pink or fuchsia color, which is optimistic and mainly chosen to add small color accents to window display decoration, especially in decoration boutiques and woman’s fashion stores. Niagara: Niagara is another shade of blue. This color conveys peace and is much more subtle than Island Paradise. It’s suitable for decorating window displays during different seasons, though we like using blue (whatever the shade) during hotter seasons of the year. Kale: Kale is a shade of green similar to the famous army green. It’s the perfect color for decorating autumn window displays, though it can be used during winter as well. We adore it because it matches with many other colors. Lapis Blue: This is a bright blue color, similar to electric blue. Its intensity is used to create color accents in window displays. We suggest not using it as a main color, but rather for small color bursts… we adore it! 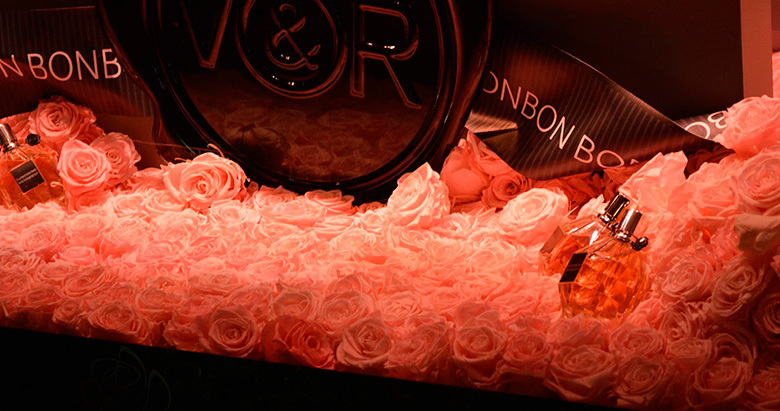 What other colors are in style this season for decorating window displays? Will you tell us about them? Which colors will you choose and what type of business do you have? We eagerly await your responses in the comments of this post! Remember that every type of business has certain colors that work better than others. 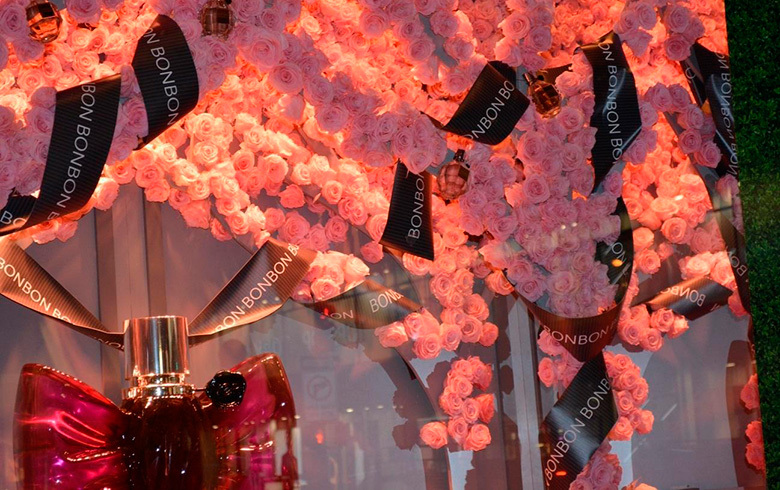 Below, we’ll give you some ideas for decorating a window display. Use plants and branches to give a sense of nature: It’s not necessary to overwhelm a window display with colorful plants and flowers. A subtle touch of green, coupled with branches and plants, may be the perfect detail to evoke nature and freshness. That’s what we can see in the image below. This pharmacy window display seeks to catch the eye of customers to increase sells for some Bio products. Use a plant element as the main event: As you can see in the image below, you can use a single plant element, in this case a tree, to create a window display where it’s the main event. This is a good way to grab everybody’s attention as they walk by on the sidewalk. It adds that necessary color accent and gives a sense of liveliness. Enhance height and verticality: If you have a small window display, it’s recommend that you enhance the height and verticality of the space, using hanging objects, for example. Create a scene: A reduced space shouldn’t prevent you from creating an original scene using a main element to catch the attention of passersby. Try lettering: Go for lettering placed over the glass to convey certain messages. It’s a widely used option for certain small window displays in some businesses, including gift shops for example. Use plants, flowers and trees moderately: Thinking about how to decorate a window display with flowers if the space is small? For small window displays, we recommend using plants, flowers and trees that aren’t large. The best trees for decorating small spaces are those capable of creating height, i.e. those that are tall, but not wide or bulky. Ikea is a company with constant originality when it comes to decorating their shops with plants. They’ve placed green plants in hotspots around their shops to give the space a natural touch. As you can see in the image above, one of the plants used in decoration is eucalyptus. 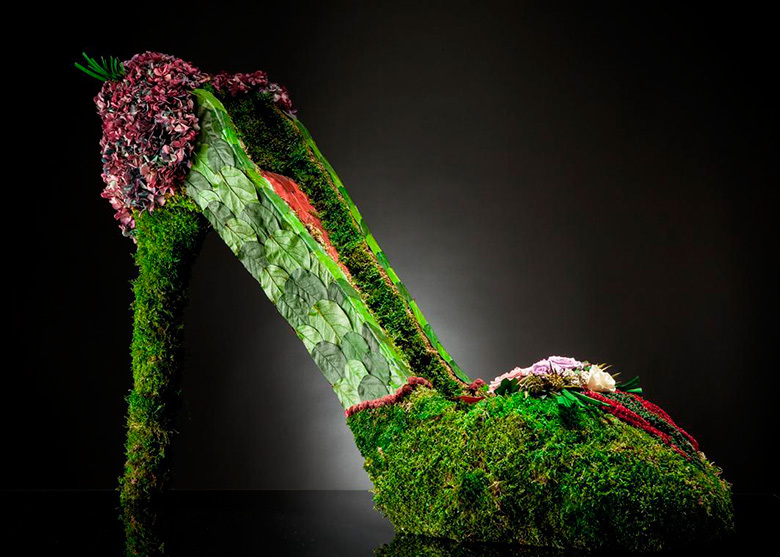 Another brand (this time in fashion) that has used flowers in fresh ways is Chanel. During New York Fashion Week, they decorated the runaway using a very floral design.